Despite the inclement weather conditions there was a very good attendance for the Westmeath Community Development Care and Repair information event in the Shamrock Lodge Hotel in Athlone last week. The event was organised by Westmeath Community Development, under the Care and Repair service, as part of the piloting of a Home Visit service being rolled out in Athlone, and also an opportunity to increase the profile of the Repair service amongst potential volunteers and older people in the region. The training was delivered by Claire Bellis from Age Action, who are responsible for the project nationally. Athlone was identified for the piloting of the Home Visit service, following discussions with CAIRDEAS, a grouping of local groups spearheaded by Cllr Frankie Keena. “It is great to see the progress that has been made in relation to providing the Home Visit service in Athlone since CAIRDEAS first came together. CAIRDEAS is made up of many local groups who all had the same idea in mind – could we get a Home Visit service in place for older people who might feel lonely or isolated, and working with Westmeath Community Development we are now looking the service commencing from early April,” noted Cllr Keena. Ian O’Flynn, Manager, Westmeath Volunteer Centre, said, “ the Volunteers for Care and Repair provide an invaluable service for older people in the community. Our repair volunteers are available and ready to work with people, and with the rolling out of the Care element or Home Visit service, we do anticipate much greater demand from older people in the coming months and we would encourage anyone who might be interested in volunteering, for either service, to get in contact with us in Westmeath Volunteer Centre”. Full information on the Care and Repair scheme is available from Westmeath Community Development , by contacting Ann or Marian at 044 9348571, or by contacting Ian or Michelle in Westmeath Volunteer Centre at the same number. This year, The Gathering is here and we are looking for people who like the craic, are willing to help and make a difference. If you would like to take part in any event as a meeter and greeter just let us know! Also, if you are thinking of staging an event, let us know and through the Westmeath Volunteer Centre we will search for volunteers and stewards! 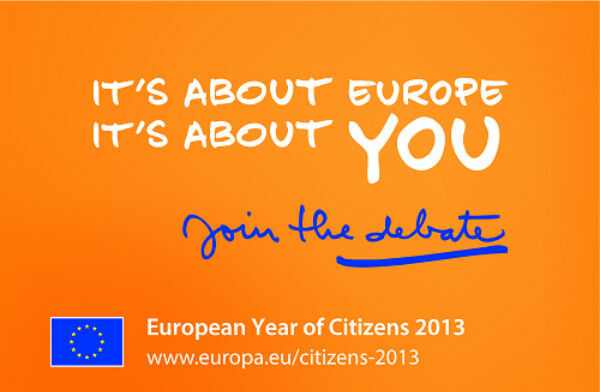 This year it is European year of the citizen so see what you can do to celebrate it! Below is a picture of Michelle Raleigh, our new Volunteer Support Worker with Westmeath Volunteer Centre and Anne Campbell of the Westmeath Care & Repair Service celebrating with the CEV (European Volunteer Centre) Flag that is currently touring the country! To celebrate the designation of 2013 as the European Year of Citizens, and to mark the launch of the year, the Department of the Taoiseach and the European Commission are delighted to present you with the opportunity to participate in the Citizens’ Dialogueevent, taking place in Dublin during the Irish Presidency of the Council of the EU. This event will provide interested citizens with a unique opportunity to attend the launch of the European Year of Citizens with the Taoiseach, Enda Kenny TD; the Tánaiste Eamon Gilmore TD and the President of the European Commission, José Manuel Barroso. Following the launch, you will have the opportunity to engage in a Citizens’ Dialogue – a frank and open exchange of opinions on the current economic crisis, the rights of European citizens and the future of the European Union - with Vice-President of the European Commission, Ms Viviane Reding and Minister of State for European Affairs, Lucinda Creighton TD. Application to attend this event is open to all citizens. However, due to the limited number of available places, and the high demand anticipated, if you are interested in attending, we kindly request that you visit www.europeanmovement.ie/citizens-dialogue/and fill in the short Expression of Interest form there. This form is also available to download as a PDF and can be posted to Citizens’ Dialogue, European Movement Ireland, 6 Merrion Square, Dublin 2. Please feel free to forward this diary notice to your network. Invitations will be issued following submission of the Expression of Interest form.